The Black Bear Inn is your perfect home base for recreation! Beautiful Sequoias, amazing scenery, and manicured gardens throughout 1.3 acres – all for your enjoyment. Room rates include a full Chefʼs breakfast daily and local wines with a customized cheese & charcuterie plate every evening. 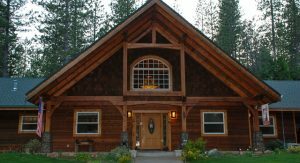 The Black Bear Inn is close to restaurants, wineries, golf courses, skiing, antique shops, galleries, apparel and gift shops. At 4,000 feet, you can head down the mountain for wine-tasting, entertainment, and great shopping. A truly year round destination! We also host/cater small and large events (weddings, family reunions, special birthday and anniversary weekends, etc.). Contact us for a personal tour.